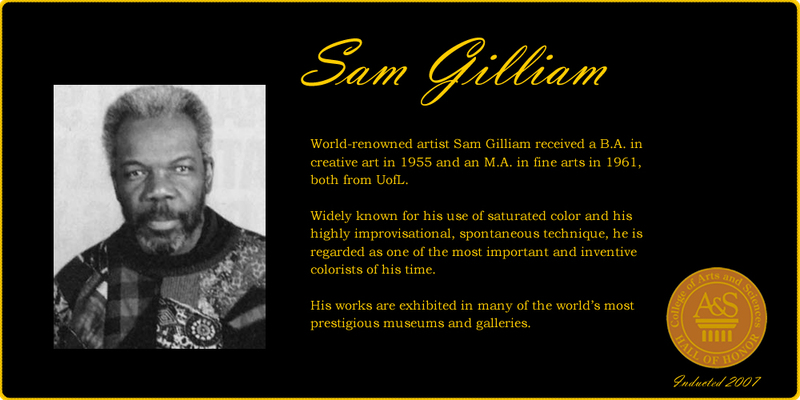 Sam Gilliam, an alumnus of UofL’s College of Arts and Sciences at both the undergraduate and graduate levels, is a highly acclaimed and world renowned artist. He is widely known for his use of saturated color and his highly improvisational, spontaneous technique. He is regarded as one of the most important and inventive colorists of the last 30 years. Mr. Gilliam received a B.A. in creative art in 1955 and an M.A. in fine arts in 1961. He has taught at a number of universities, including the Maryland Institute of Art and Carnegie Mellon University. 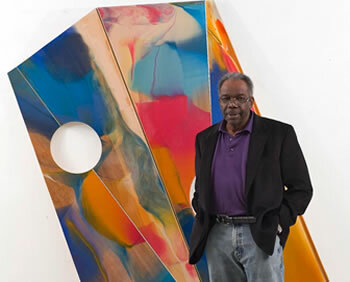 He retired from teaching in 1989 and operates a studio in a historic district in Washington, D.C.
Mr. Gilliam became well-known in the late 1960s with his own unique approach to “painting as object” so that color is structured by the form of the canvas itself. The sculptural effects he achieved with this technique gave him national repute, and his work has found audiences worldwide. His current work includes multimedia installations that employ brightly stained polypropylene, computer generated imaging, metallic and iridescent acrylics, hand-made paper, aluminum, steel, and plastic. 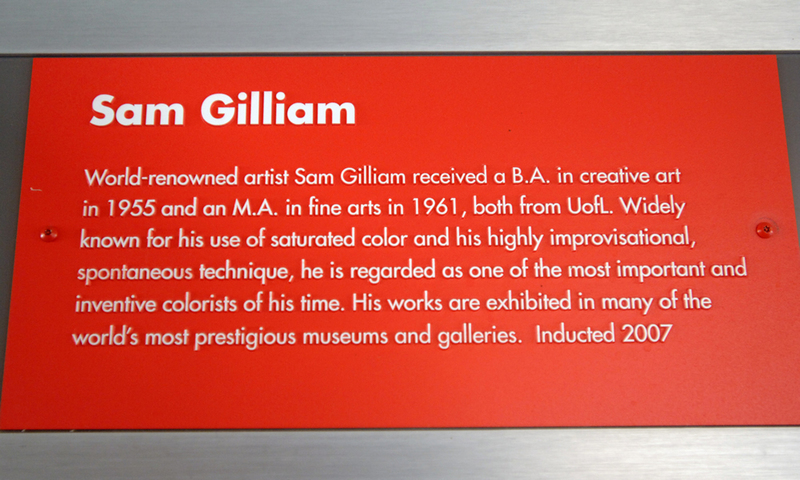 Mr. Gilliam has had 20 solo exhibits and has created 32 public art pieces, some of which can be found in Detroit, New York, Atlanta, San Francisco, and Boston. His work is in the permanent collections of 56 museums including the Metropolitan Museum of Art, the Museum of Modern Art (New York), the Whitney Museum of American Art, the National Gallery of Art, the National Museum of American Art, the Art Institute of Chicago, the Corcoran Gallery, the Hirshhorn Museum, and Louisville’s own Speed Art Museum. He has served on the board of the Speed Art Museum and he frequently returns to Louisville to participate in arts events. Mr. Gilliam’s professional honors include honorary doctorates from eight universities, the Kentucky Governor’s Award in the Arts, several National Endowment for the Arts grants, the Longview Foundation Award, a Guggenheim Fellowship, the Art Institute of Chicago’s Norman W. Harris Prize, and an Artist’s Fellowship from the Washington Gallery of Modern Art. 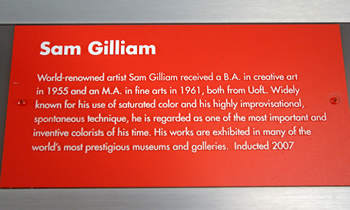 In 2006, Mr. Gilliam was named the University of Louisville’s Alumnus of the Year. Mr. Gilliam's sisters, Lillie Gilliam and Lizzie Miller, accepted Sam Gilliam's College of Arts and Sciences Hall of Honor medallion from Dean J. Blaine Hudson. 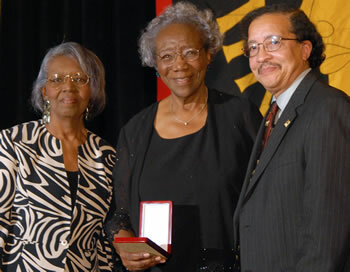 Mr. Gilliam was unable to attend the November 9, 2007 induction ceremony.